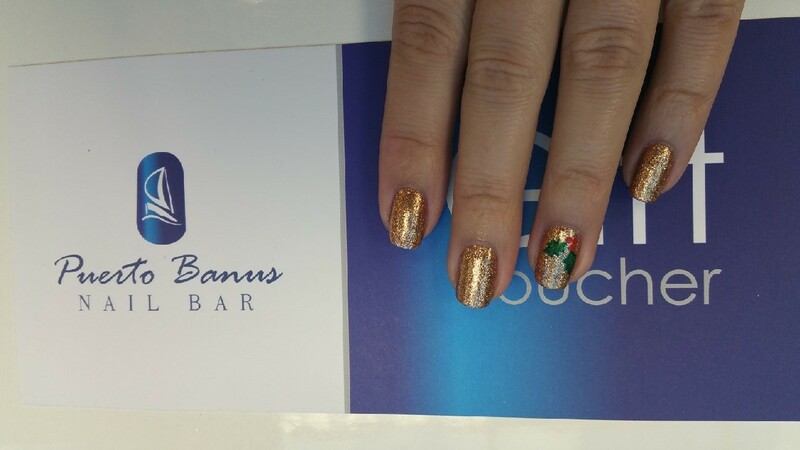 It’s the second week of December and Christmas parties are in full swing. 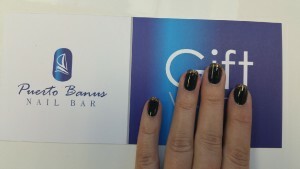 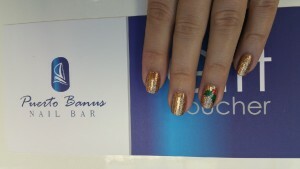 When, if not now, can you let your imagination fly when it comes to your nails! 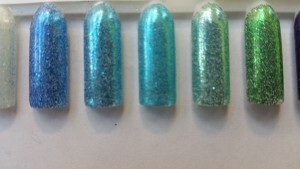 But before we get into nail art ideas, let’s continue on the glitter design. 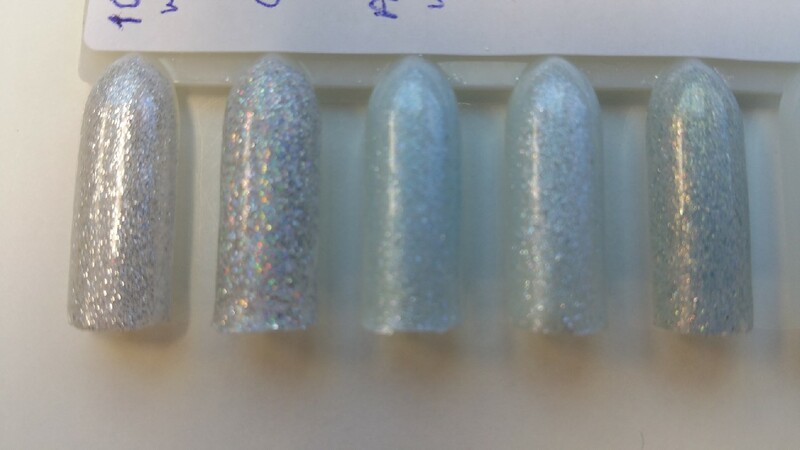 Because, no matter what the trends, each year glitter stays the most popular choice for Christmas nails. 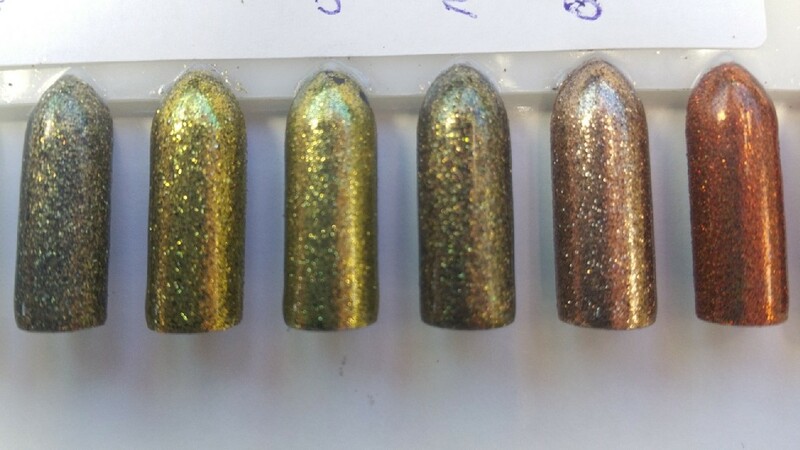 Last month we had a post about different glitter polishes, which could be used as a full set, on its own or as layering on top of other colour polishes. 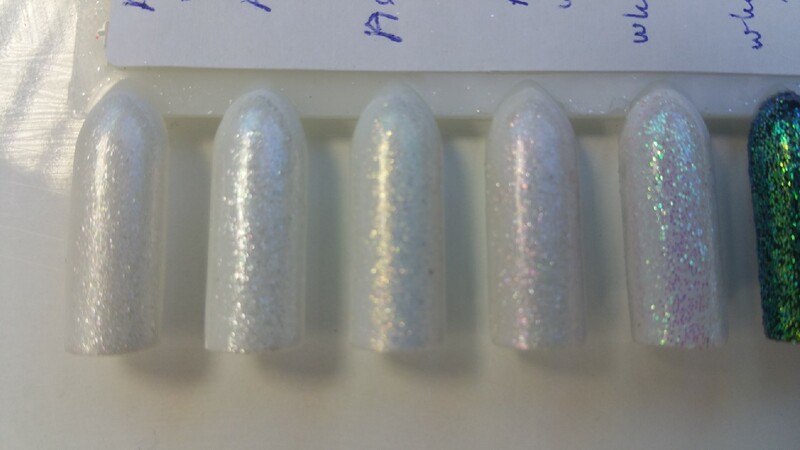 But there is also a great choice of loose glitter design, which would be used to give a more intense sparkle. 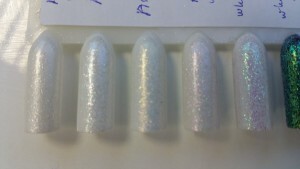 This type of glitter would be used for an accent nail, on the nail tips, to create half-moon manicure or other designs. Certain glitters that are ultrafine, like glitters by Lecente or Emi brands, can be used as an overall colour as it bonds perfectly with the polish by giving it a complete coverage. We did few examples over Vinylux nail polish by CND. 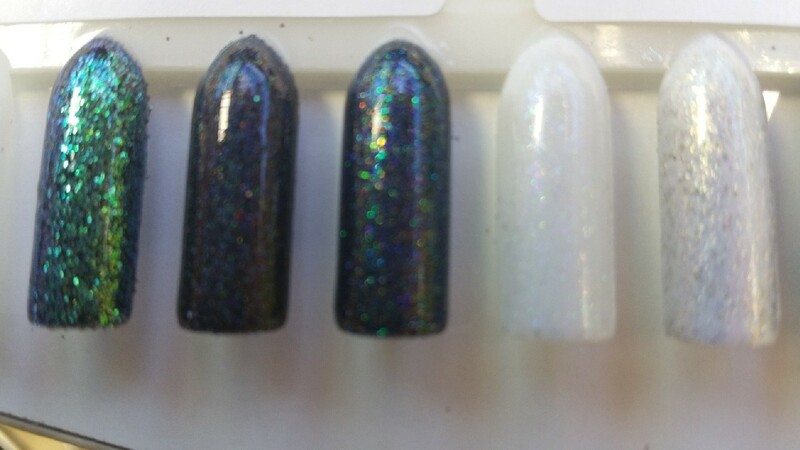 A quick tip, if you also intend to use Vinylux, keep in mind that it dries really fast. 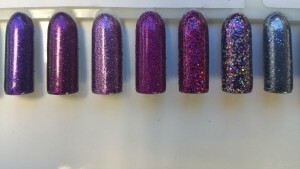 After you apply a second coat of polish, you can go straight on to gently dabbing in the glitter. 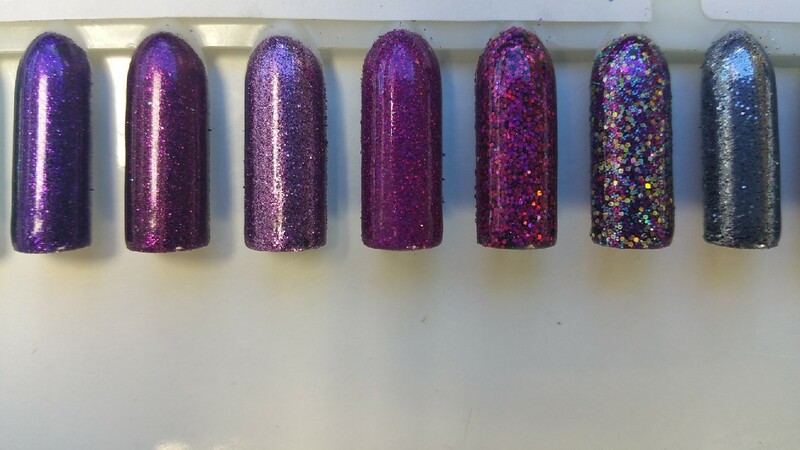 If you wait too long, glitter won’t stick. 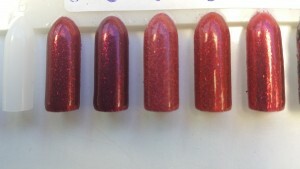 In first example, we used Cardinal glitter by Lecente. 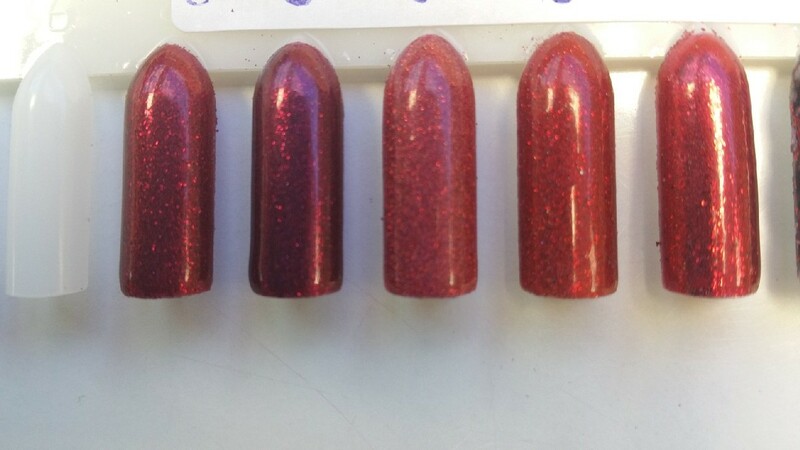 We used Wildfire as a base colour, but to be honest, it wouldn’t matter, which colour is used as a base, because this type of glitter has a hundred present coverage. 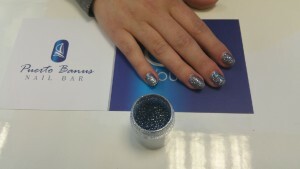 In the second example we used Blue gunmetal also by Lecente. We love this type of glitter because after it bonds with the polish, you can brush off all gritty bits and it almost becomes metallic. 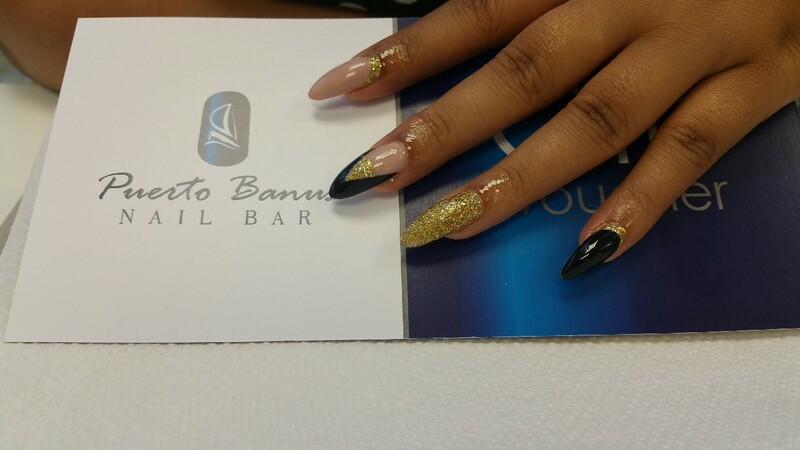 It is perfect for clients who like a very smooth and glossy finish. 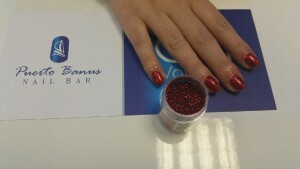 Here is another example of glitter by Emi, used as an overall colour, and on the nail tips for a French look. 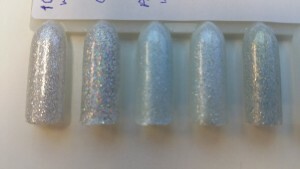 In these examples glitter is used for the cuticle area, and to create triangle design element. 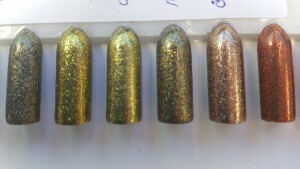 There is a notion that glitter is usually silver or gold, but there is a very wide colour range available. 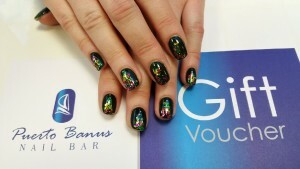 So you can choose glitter design of contrasting colour to make an impact, or similar colour to enrich the look. 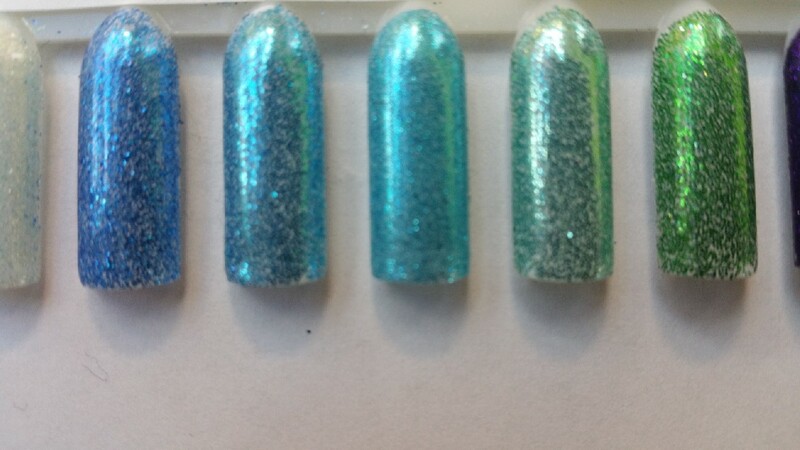 These are some of the glitters available at our Puerto Banus nail bar.